Newstweek is a device for manipulating news on major news portals in the country. In public places with free wireless access to the Internet, the artists will build a small device into a wall plug, making it appear as part of the local infrastructure. During the public intervention, the gallery will be turned into a press center where visitors and agents will remotely edit news read on laptops, phones and tablets without their users knowing. 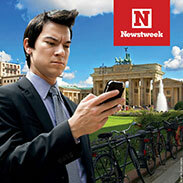 Hotspots manipulable by Newstweek include cafes, libraries, hotels, universities and city-wide wireless networks. In the Ljubljana edition of the project, wireless hotspots with Newstweek transmitters built in them will be at the Bi-Ko-Fe bar (Židovska steza 2, Ljubljana) and Kavarna SEM | Slovenski etnografski muzej cafe (Metelkova ulica 2, Ljubljana). Newstweek is one of the most insightful socially-engaged hacking projects of the year. Last year it won the authors the prestigious Golden Nica Prix in the Cyberarts category at the Ars Electronica festival in Linz, Austria. This year the authors will install the device into the Ars Electronica Center as part of its festival collection, and before that they will perform their public intervention in Ljubljana. Newstweek emerges as a symptom of our increasingly corporatized and mediated democratic reality. While news is increasingly read digitally, it still follows a traditional, top-down distribution model and thus often falls victim to the same political and corporate interests that have always sought to manipulate public opinion. Newstweek intervenes in this model, providing an opportunity for citizens to have their turn at manipulating the media, “fixing facts” as they pass across a wireless network. In this way Newstweek can be seen as a tactical device for altering public reality on a per-network basis. Newstweek also signals a word of caution, that a strictly media-defined reality is always a vulnerable reality; that along the course of news distribution there are many hands at work, from ISP workers, numerous server administrators and wireless access point owners. Moreso, with the increasing ubiquity of networks and their devices comes greater ignorance as to their function, offering a growing opportunity for manipulation of opinion, from source to destination (from server to screen).